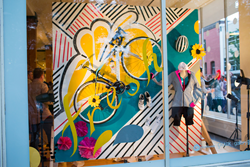 Local handcrafting lifestyle expert Lia Griffith leads the winning team using merchandise from West End Bikes in IDL Worldwide's Design Fight Club, a bikes- and cycling-themed window curation competition. The winning display: "Summer's Always Better on a Bike"
IDL Worldwide hosted their annual Design Fight Club on April 21 in support of Design Week Portland, a week-long, city-wide series of programs exploring the process, craft and practice of design across all disciplines. More than 150 guests gathered at IDL’s ground floor gallery space to cheer on four teams as they competed to design and curate bicycle- and cycling-themed window displays. At the head of each team were four industry-leading special guests: handcrafting lifestyle expert Lia Griffith; Nike Brand Designer Matt Howard; designer, artist and futurist Antonio Brasko; and experiential/industrial designer Lee Croy. Team leads were armed with four multi-disciplinary support team members and given two hours to create the ultimate display utilizing only the materials provided. In a pantry of supplies, the teams had access to pedestals, crafting supplies, tools, mannequins, graphic components and props. For the primary display element, IDL partnered with local bike shops to provide a selection of merchandise as the spotlight of each window. The winning display was determined per the votes of those in attendance. 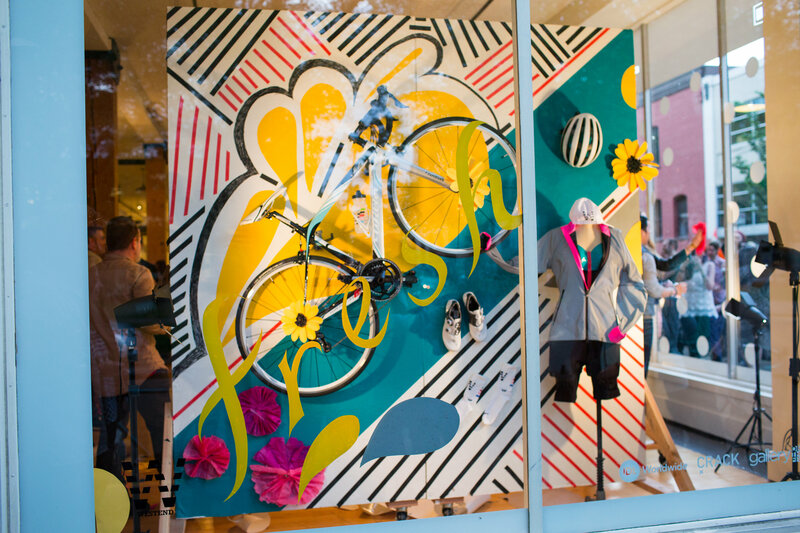 Lia Griffith and her team’s colorful “Summer’s Always Better on a Bike”-themed display earned the title featuring merchandise from West End Bikes. The curated windows remained on display to the public through the duration of Design Week. Local partners included KOi Fusion, West End Bikes, River City Bicycles, Athlete’s Lounge, and Bike Gallery. IDL Worldwide is a global brand services firm that delivers strategy, creative, execution and reporting of in-store marketing programs that range from temporary graphics to store fixtures and everything in between. Our retail centric approach spans from generating brand strategy to fabricating brand solutions. It’s this unique perspective that allows us to implement effective campaigns and communications where it matters most - in stores.